Nobel laureate Donald Glaser (PhD ’50) and his family have made a pair of significant commitments to the Caltech community. Scroll down for a slideshow of archival images that trace Glaser's scientific path and highlight art and music inspired by his work. The path that the late Nobel laureate Donald Glaser (PhD ’50) cut in the scientific world was distinctively Caltech. He focused on fundamental questions about the universe and created tools that led to new revelations. His curiosity, and his desire to make the biggest difference he could, drove him to switch his focus from high energy physics to molecular biology, and later to neurobiology. As an unexpected side effect, his work also has inspired artists and composers. 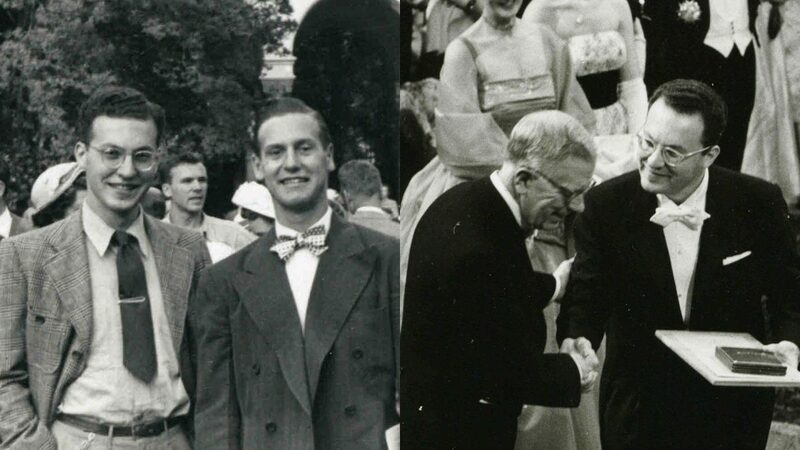 The photograph on the left shows Donald Glaser (left) on his graduation day in 1950, posing with an unidentified person. In the picture on the right, Glaser (right) accepts his Nobel Prize in Physics from King Gustaf VI Adolf of Sweden in 1960. 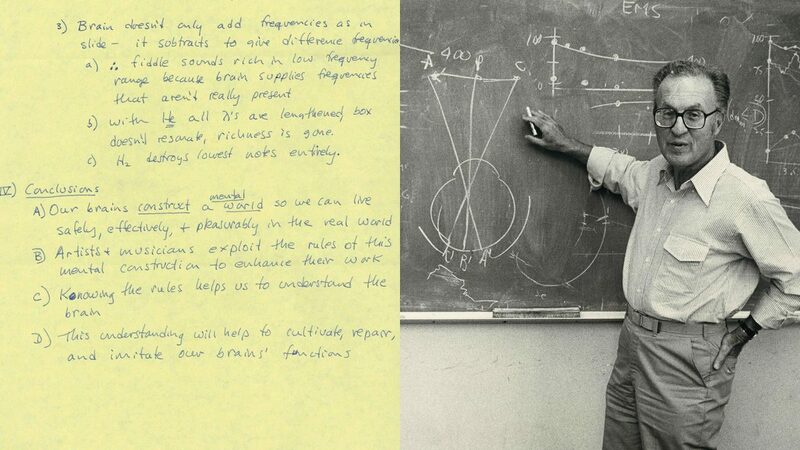 This slideshow contains images provided by the Caltech Archives. Glaser and his family have made a pair of significant commitments to the Caltech community. They established the Donald A. Glaser Fund for Experimental Physics, which will support young scholars at Caltech far into the future, with a $10 million bequest. His family also chose to make the Caltech Archives the home for Glaser’s personal and scientific papers—historical materials that are being digitized in order to provide access for the general public. 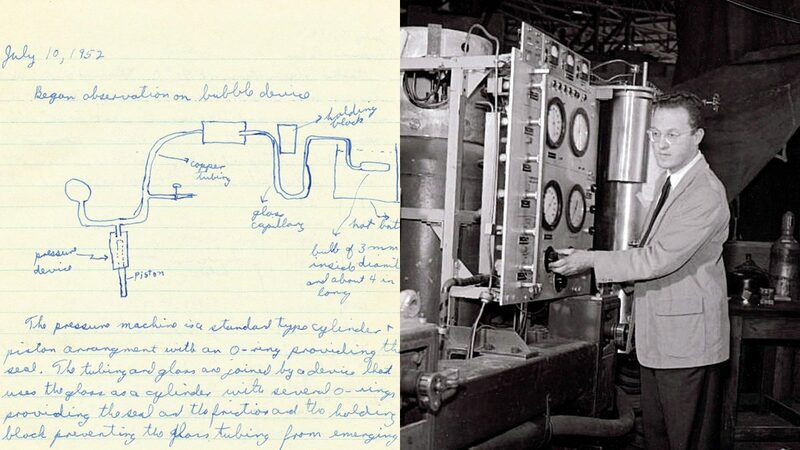 At left is a page from Glaser’s journals with a diagram of his signature early achievement, the bubble chamber. At right, Glaser poses with the bubble chamber in a photo taken circa 1959, the year he joined the faculty of UC Berkeley after 10 years at the University of Michigan. With his invention of the bubble chamber, Glaser enabled researchers to learn about exotic and unstable subatomic particles by photographing the trails they left in a near-boiling liquid. He had seen firsthand that the instrument’s predecessor, the cloud chamber, was too slow for some experiments when he was completing his thesis work on cosmic rays. At Caltech, Glaser became part of a notable scientific lineage: His graduate adviser was Carl Anderson (BS ’27, PhD ’30), Nobel laureate and discoverer of the positron, who had studied under Nobel laureate and Caltech co-founder Robert Millikan. 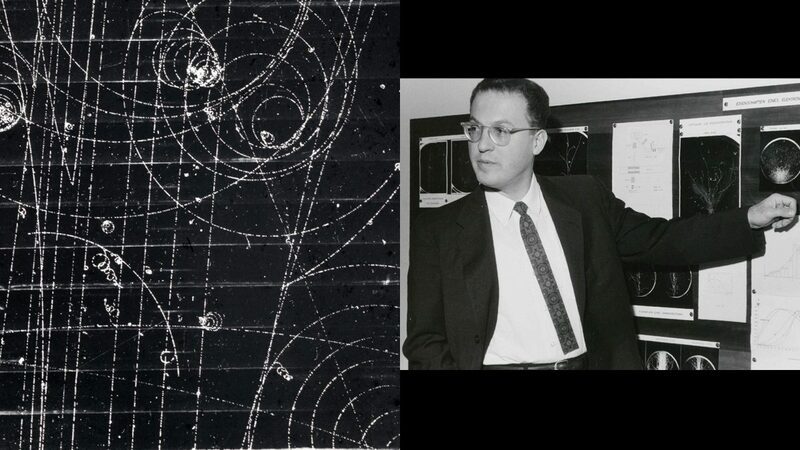 At left is a photo of Glaser with the bubble chamber in 1960, the year he won the Nobel Prize in Physics. 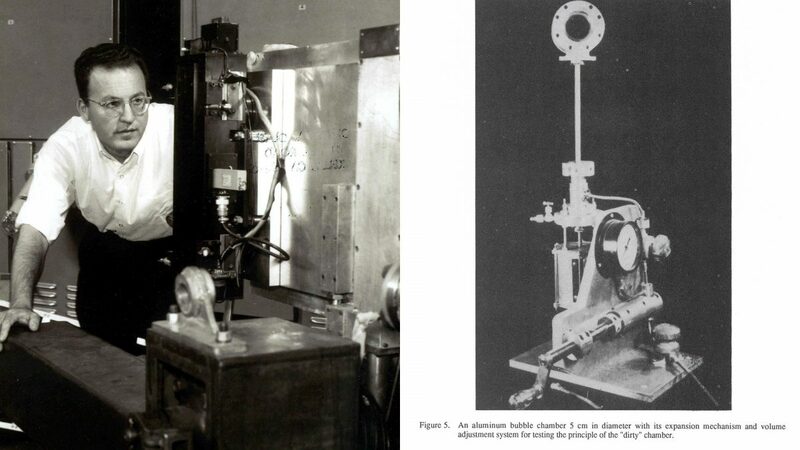 At right is a photo showing an early version of the instrument, taken from his paper “Invention of the Bubble Chamber and Subsequent Events,” part of a July 1994 issue of Nuclear Physics B with the proceedings of a conference about the instrument and its legacy. 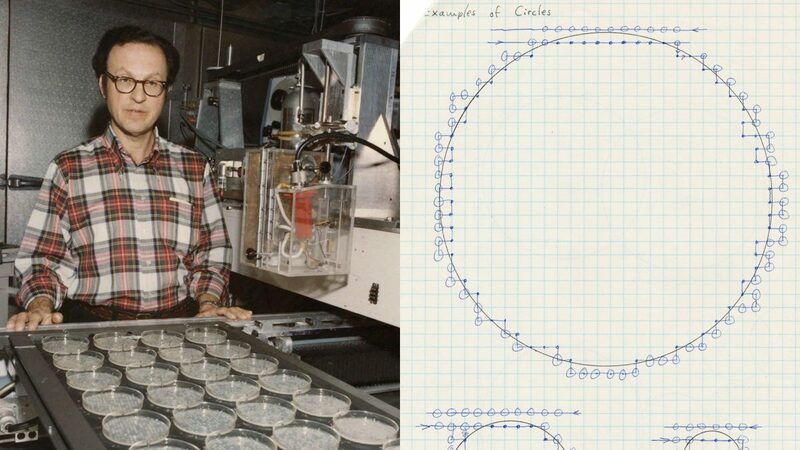 Glaser recounted part of his motivation for creating the bubble chamber in his journals: “Data about these new particles were collecting slowly in a hit-and-miss fashion. . . . I began to daydream of the possibilities of changing some of these experimental conditions to increase the rate of data collection.” With this new instrument, he opened up possibilities that enabled him and many other physicists to make fundamental discoveries. He was only 34 years old when he received the Nobel Prize in Physics for his invention in 1960. At left is a historic bubble chamber image taken by scientists at Brookhaven National Laboratory in 1964, which captures the trail of an elementary particle called the omega-minus baryon. This discovery supported a 1962 prediction by Caltech Nobel laureate Murray Gell-Mann, part of his pioneering theoretical work on subatomic particles he named “quarks.” At right, Glaser gives a presentation during his trip to Sweden in 1960 to receive the Nobel Prize in Physics. Joining the ranks of Caltech Nobel laureates marked a turning point for the young scientist, but the honor left some angst in its wake. In his diaries Glaser wrote, “Here I sit at the age of 35, a Nobel Prize winner in physics nearly two years ago, and unable to decide on a definite course for my scientific efforts. Other parts of my life seem to drift aimlessly also—without plans or enthusiasms of long range.” These feelings—along with his dissatisfaction about the increasing size of physics research groups—factored into a dramatic move: He completely switched scientific fields. At left, visiting Caltech en route to Sweden to collect the Nobel Prize in Physics in 1960, Glaser (far left) receives congratulations from fellow physicists: Richard Feynman (who won a Nobel Prize in Physics in 1965), Robert Bacher (later to be Caltech’s first provost), and Robert Leighton (BS ’41, MS ’44, PhD ’47). At right is the page from Glaser’s notebooks that contains the quotation above. Changing from particle physics to the emerging field of molecular biology, Glaser began to study how cells become cancerous. He saw precedent for his change: Major breakthroughs in biology had started with researchers trained in physics—such as Caltech’s Max Delbrück (also a Nobel laureate) and Seymour Benzer. In his biological work, Glaser maintained his focus on inventing tools to advance science. Looking to test Darwinian ideas at the cellular level, he created “the dumbwaiter”—not a small elevator but rather a machine that sped up experiments by automating the processing and observation of large batches of samples. He would become a biotechnology pioneer in 1971 when he co-founded Cetus, a company that used automation for tasks such as improving the yield of a microbe that produces an antibiotic. At left is Glaser in his laboratory at UC Berkeley with his dumbwaiter. At right is a conceptual sketch from his work on automating laboratory processes in biology. 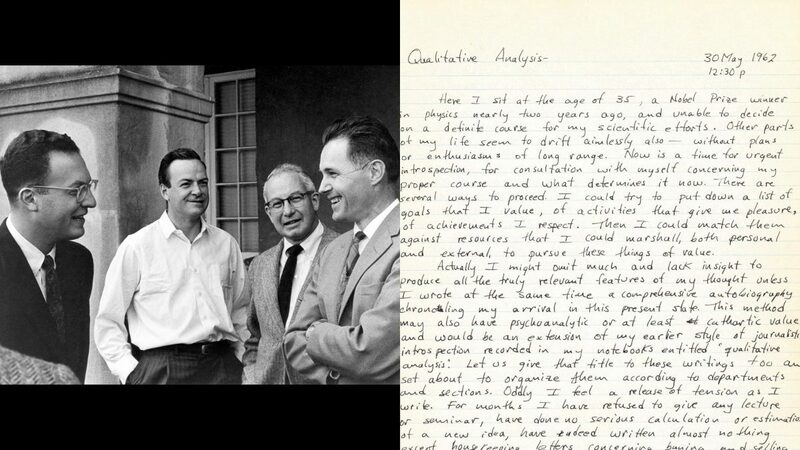 At left is a page from Glaser’s notes containing the passage quoted above. At right is a 1985 photo from the San Francisco Examiner that shows Glaser speaking about vision and the brain. Beyond research and reinvention, Glaser enjoyed an additional outlet for his creativity—music. His high school orchestra included numerous future professional symphony musicians. He played viola in the Cleveland Philharmonic in the 1940s when he was an undergraduate at Case Institute of Technology (now Case Western Reserve University). At Caltech, other students joined him to form Pasadena’s first string quartet. Making music remained a longtime passion for the “lapsed violist,” as Glaser referred to himself in his papers. 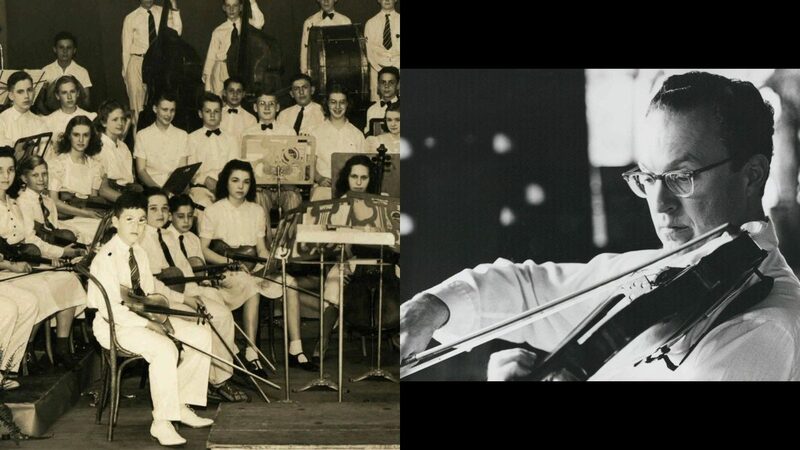 At left is a photo of Glaser as a youth, filling first chair in his student orchestra. At right, he practices as an adult. Glaser and his bubble chamber have inspired art and music—from drinking songs to photography to symphonies. One result was the chamber symphony Dr. Glaser’s Experiment by Darren Bloom, commissioned by the London Symphony Orchestra for its 2016 LSO Futures festival. That same year, Caltech began hosting the photo exhibit Nature’s Point by Eric William Carroll, highlighting Glaser’s scientific imagery. 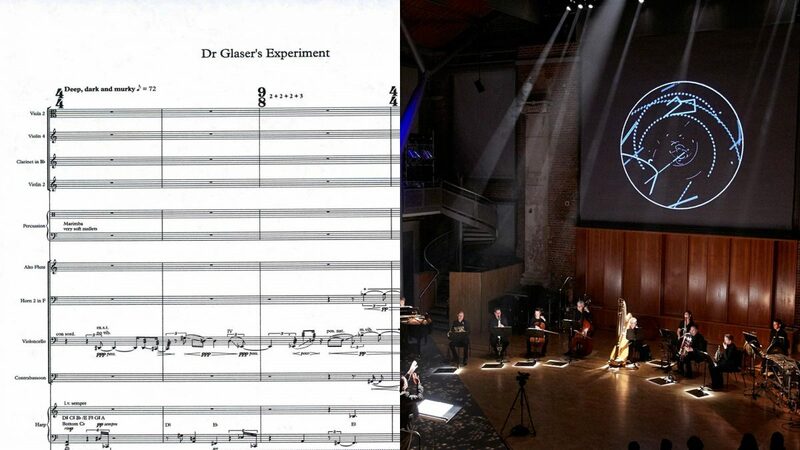 Above are two views of Dr. Glaser’s Experiment: sheet music and a 2016 photo of the London Symphony Orchestra Chamber Orchestra playing the piece while bubble chamber–inspired images are projected overhead. The trove of material now in the care of the Caltech Archives represents only one way Donald Glaser’s legacy continues at his alma mater. The spirit of exploration that drove him lives on in today’s Caltech scholars. And further bolstering the future, the Glasers’ estate will provide for the Donald A. Glaser Fund for Experimental Physics. This fund will offer prize fellowships to graduate students and postdocs working at the frontiers of their field—creating the flexibility and the freedom for them to pursue their best ideas wherever they may lead. 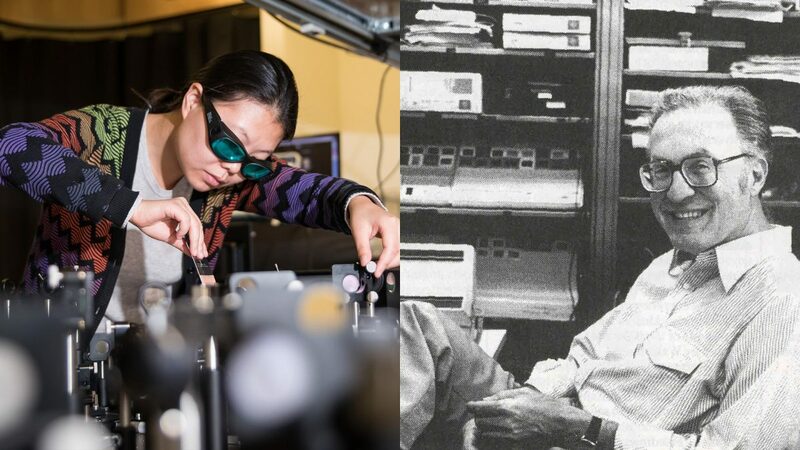 At left is one contemporary face of experimental physics at Caltech, postdoctoral scholar Liuyan Zhao, working in the lab of assistant professor of physics David Hsieh. At right is Glaser in a San Francisco Examiner photograph that accompanied a 1985 article about him.